2008-03-25. New. Ships with Tracking Number! INTERNATIONAL WORLDWIDE Shipping available. Buy with confidence, excellent customer service! 2007-08-03. Good. Ships with Tracking Number! INTERNATIONAL WORLDWIDE Shipping available. May not contain Access Codes or Supplements. May be ex-library. Shipping & Handling by region. Buy with confidence, excellent customer service! 2018-06-05. New. Ships with Tracking Number! INTERNATIONAL WORLDWIDE Shipping available. Buy with confidence, excellent customer service! 2007-08-03. New. Ships with Tracking Number! INTERNATIONAL WORLDWIDE Shipping available. Buy with confidence, excellent customer service! 2009-08-09. New. Ships with Tracking Number! INTERNATIONAL WORLDWIDE Shipping available. Buy with confidence, excellent customer service! Delacorte Press. Used - Very Good. Very Good condition. Very Good dust jacket. Smith, Elder and Co., London., 1859. Good. Contemporaneous full calf with five raised bands, gilt tooling and gilt lettered tiles to spine. Upper board joint split 2 inches at head. Ex-library; usual stamps and markings. Armorial bookplate to front pastedown. xvi, 522pp.. First printing. . Hard. 8vo. 8 3/4".. Good. 2008-02-04. New. Ships with Tracking Number! INTERNATIONAL WORLDWIDE Shipping available. Buy with confidence, excellent customer service! 2007-07-02. Good. Ships with Tracking Number! INTERNATIONAL WORLDWIDE Shipping available. May not contain Access Codes or Supplements. May be ex-library. Shipping & Handling by region. Buy with confidence, excellent customer service! 2008-03-25. Good. Ships with Tracking Number! INTERNATIONAL WORLDWIDE Shipping available. May not contain Access Codes or Supplements. May be ex-library. Shipping & Handling by region. Buy with confidence, excellent customer service! Bantam Press, 2007-04-02. Paperback. Used:Good. 2018-06-05. Good. Ships with Tracking Number! INTERNATIONAL WORLDWIDE Shipping available. May not contain Access Codes or Supplements. May be ex-library. Shipping & Handling by region. Buy with confidence, excellent customer service! Random House Large Print. Hardcover. 0739327151 New Condition. . New. Dell. MASS MARKET PAPERBACK. 0440244986 New Condition. . New. Dell. MASS MARKET PAPERBACK. 0440243661 New Condition. . New. Delacorte Press. Hardcover. 0385340559 New Condition. . New. Bantam. PAPERBACK. 1984818953 New Condition. . New. Bantam Press. PAPERBACK. 0593057007 New Condition. . New. Bantam. PAPERBACK. 044042335X New Condition. . New. 2011-08-05. Good. Ships with Tracking Number! INTERNATIONAL WORLDWIDE Shipping available. May not contain Access Codes or Supplements. May be ex-library. Shipping & Handling by region. Buy with confidence, excellent customer service! Bantam Press, 2007. paperback. New. Author Signed UK Trade Paperback Book 2007 LON: Bantam Press UK Trade Paper edition, first printing, mint, new/unread in flawless pictorial wraps, signed by the author. New York: Delacorte Press. Near Fine in Near Fine dust jacket. 2007. First Edition; First Printing. Hardcover. 9780385340557 . Gently read copy. International orders may require additional postage. ; Simply signed on the title page by Lee Child. Full number line. ; Jack Reacher, No. 11; 9.10 X 6.30 X 1.20 inches; 384 pages; Signed by Author . 2008-02-04. Good. Ships with Tracking Number! INTERNATIONAL WORLDWIDE Shipping available. May not contain Access Codes or Supplements. May be ex-library. Shipping & Handling by region. Buy with confidence, excellent customer service! 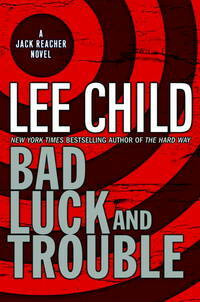 BAD LUCK AND TROUBLE: A Jack Reacher Novel. London:: Bantam,, (2007.). Fine in fine dust jacket.. First printing. Ten years after he left the military police, Reacher is still a loner, with no possessions other than his folding toothbrush - but when the body of one member of the Special Investigative unit he headed in the military is found in the desert, dropped from a helicopter, he gets back together with the surviving members of that crack unit - to prove once again the truth of their motto - 'You do not mess with the Special Investigators.' Lots of fast action! SIGNED on the title page. 411 pp. plus 2 pp listing the earlier titles in the series. New York: Delacorte Press, 2005. SIGNED by the AUTHOR on the Title page. Signature only First edition, First printing. Book is in Very Good + condition. Boards are clean, not bumped. Fore edges have a small amount of reading wear. Interior is clean and legible. Not remaindered. Dust Jacket is in Near Fine condition. Not chipped or crinkled. Not price clipped. Dust Jacket is covered by Mylar wrapper. Thanks and Enjoy. All-Ways well boxed, All-Ways fast service. Thanks.. Signed by Author. First Edition. Hard Cover. Very Good +/Near Fine. Bantam Press. Hardcover. 0593057015 This hardcover book is Fine, being square and tight. The boards and spine have no wear with pristine lettering. The pages and endpages are clean, with no markings or folds. The dustjacket is As New. Original Price is intact. Not ex-lib. No remainder mark. This copy is signed by the Author on the title page without inscription. . Fine. 2007. First Edition. New York: Delacorte Press, 2007. 1st. Hardcover. Fine condition / Fine condition dust jacket. Signed by the author on the title page. Nashville, Tn: Delacorte Press, 2007. Book. Near Fine. Hardcover. Signed by Author(s). 1ST. An Excellent Copy - Signed By The Author On The Title Page. A First Edition, First Printing. Book Is In Near Fine Condition. Boards Are Clean, Not Bumped. Fore Edges Have A Tiny Bit Of Shelf Wear. Interior Is Clean And Legible. Not Remaindered. Dust Jacket Is In Near Fine Condition. Not Chipped Or Crinkled. Not Price Clipped. Dust Jacket Is Covered By Mylar Brodart. Thanks And Enjoy..
United States: Delacourt Press, 2007. 1st Edition 1st Printing. Hardcover. Near Fine/Near Fine. Book and jacket are clean and tight with no marks or stamps. Signed on the title page in my presence by Child. First edition, first printing. Jack Reacher volume 11. New York: Delacorte Press, 2007. Book. Fine. Hardcover. Signed by Author(s). First Edition/First Printing. A square solid tight carefully read copy. This copy has some light soil to the pagedges else fine. The 26.00 jacket has some light rubbing wear, minor edgewear. Reacher X 11. This copy includes a picture of Lee at the signing event. THIS COPY IS IN MY POSSESSION AND NORMALLY SHIPS NEXT DAY..
2008-03-09. Good. Ships with Tracking Number! INTERNATIONAL WORLDWIDE Shipping available. May not contain Access Codes or Supplements. May be ex-library. Shipping & Handling by region. Buy with confidence, excellent customer service! Delacorte Press. Hardcover. 0385340559 Please allow 4 - 14 business days for Standard shipping, within the US. Thank you for supporting our small, family-owned business! . Fine. 2007-05-15. Delacorte Press. Hardcover. 0385340559 Please allow 4 - 14 business days for Standard shipping, within the US. Thank you for supporting our small, family-owned business! . New. 2007-05-15.